1. Student promotion is only applied to local Malaysian students with a valid Malaysia ID card. 2. 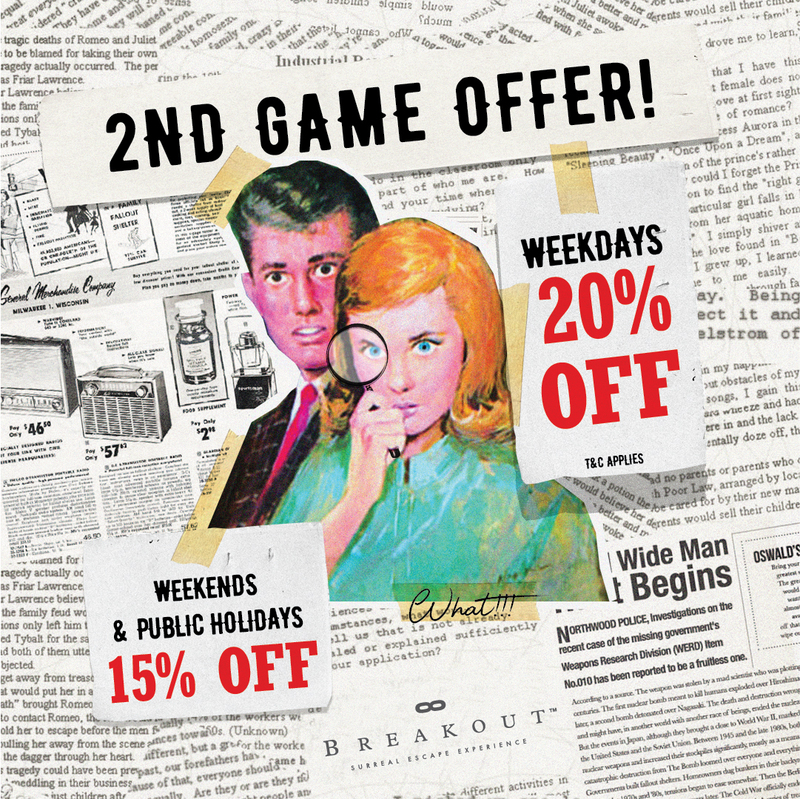 Please present your student ID card to Breakout’s reception to redeem the promotion. 3. The student below 17yrs old and below required to present Malaysia IC for verification. 4. Promotion cannot be used in conjunction with other Breakout’s on-going promotion. 5. Student discounts will be granted to the students upon arrival and validation. 6. Breakout reserves the right to amend this promotion without prior notice. 1. One (1) KADS1M offer is valid for one (1) game room per transaction. 2. The student must present an original KADS1M and NRIC for validation before making payment. 3. Minimum of 2-8 players required for one (1) game session. 4.Valid at Breakout Nu Sentral & Avenue K outlet in Malaysia only. 5.Discount is valid from Monday – Sunday, 10 AM – 10 PM except on Public Holidays. 6.This offer is valid from 1 September 2018 – 31 August 2019. Kindly book your game rooms at www.breakout.com.my. Payment will be adjusted upon arrival and it is not refundable. This offer cannot be used in conjunction with any other discounts, vouchers or packages. Breakout Management reserves the right to amend this offer without prior notice. 1. With the purchase of 1 game session, you will be eligible for a 20% off 2nd game session. 2. It is not applicable in conjunction with any other offers, promotion or discount. 3. It is not exchangeable for cash and merchandise purchase. No refund once payment has been made. 4. 20% discount on weekdays and 15% on weekends and Public Holidays. 5. Breakout reserves the right to amend the terms & conditions of this promotion without prior notice.